There is a fascinating event from the life of the Holy Prophet Elias recorded in the Bible. Because of his faithfulness to the one true God, Elias was on a run for his life, pursued by the evil Queen Jezebel who was intent on killing him. Elias fled into the wilderness and there the Lord spoke to him and said “Go out tomorrow and stand on the mountain before the Lord; and behold, the Lord will pass by….” Elias is given a promise that he will meet the Lord on that mountain. So the next day there is a great and powerful wind on the mountain…but the Lord was not in the wind….then an earthquake and a fire….but the Lord was not in either of them. Finally came a “soft, gentle breeze” and the Lord was present and spoke to Elias! Some translations of the Bible describe the coming of the Lord as a “still, small voice.” The Lord came to Elias in quiet and stillness not in fire and noise! (see 3 Kingdoms, chapter 19) This new saint of our church – St. Savvas the New – struggled throughout his life to find quiet and stillness so that he could meet the Lord in that sacred space and be close to him. St. Savvas was born with the name Basil in 1862 in Eastern Thrace, today part of Turkey, the only child of his parents. Because of the family’s poverty, Basil only completed an elementary education and then found employment in a store which his father opened for him. From a young age Basil read the lives of the Saints and was attracted to the the monastic saints who dedicated their entire lives to seeking the Lord and serving Him. While only a teen, he left home without his parents’ knowledge to enter a monastery on the holy mountain – Mount Athos. He was received as a novice in the Skete of St. Anne and along with the usual monastic obediences (work) he was given training in Byzantine chant and the painting of icons. In 1887 Basil left Mt. Athos for Jerusalem to venerate the places made sacred by the Lord’s feet. 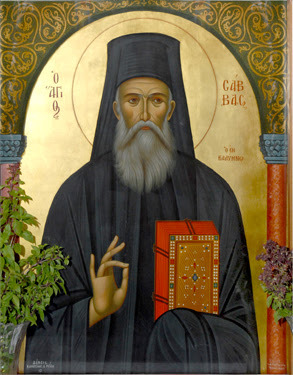 He entered the Monastery of St. George the Chozebite (see acrod.org, Lives of the Saints – St. John Jacob the Chozebite) where he was accepted as a novice. He was tonsured as a monk in 1890 and given the name “Savvas”. Continuing in his training as an iconographer, he was ordained deacon and priest in 1902. Seeking more quiet and solitude he moved to the Skete of St. Anne in the desert near the Jordan River where he lived in a hut only accessible by a rope ladder. Like the Holy Prophet Elias he was seeking a life free from noise and distractions so that he might feel that soft, gentle breeze and hear that still, small voice. Father Savvas eventually returned to his homeland of Greece first to Athens, then to the island of Patmos, wandering, trying to find a quiet place to seek the Lord with his whole heart. In 1919 Father Savvas was invited by the famed St. Nectarios of Aegina to come to the Holy Trinity Convent he had established in order to serve as the priest and to teach the nuns iconography and Byzantine chant. Father Savvas remained in this convent until 1925, forming a bond with St. Nectarios and receiving his counsel and guidance which ended with the saint’s death in 1920. It is recorded that St. Nectarios often teased Fr. Savvas with the name “Savvina” which is the female version of “Savvas” due to his gentleness and shyness. Fr. Savvas had a great respect and a devotion to St. Nectarios, it was he who performed the saint’s funeral and painted the first icon of this modern miracle worker. Due to the spreading fame of St. Nectarios, increasing numbers of pilgrims began visiting the tomb of the saint disrupting the quiet that Father Savvas yearned for. He was invited to move to the island of Kalymnos to become the priest at the Convent of All Saints. Here he spent the final years of his life living in an area remote from the convent where he found the quiet he needed for his prayer and ascetic lifestyle. Along with serving as the priest of the convent, he designed and constructed three chapels near his dwelling, painted icons, gave confession and guidance to the nuns and the local people and helped the poor and needy. The payment he received for his icons he passed on to those in need. A woman who knew him well reported that he had a rule never to have any money left in his room after sunset. To the many people who came to see him he gave them prayer ropes that he had made and instructed them in the practice of the Jesus Prayer. Some claimed to see him floating off the ground during the Divine Liturgy, others sensed a beautiful fragrance coming from him during prayer, others testified to his knowledge of future events. Father Savvas fell asleep in the Lord on April 7, 1947. As he was near death he had a burst of energy, clapped his hands and said: “The Lord! The Lord! The Lord!” He was canonized as a saint by the Ecumenical Patriarchate of Constantinople in 1992. Because we are so surrounded by noise there is backlash even among non-Christians and atheists against this deluge. Growing in popularity is a practice from the Buddhist faith known as mindfulness meditation which involves the process of developing the skill of bringing one’s attention to whatever is happening in the present moment. It includes focusing one’s attention on the moment and passively resisting the impulse to run off in our thoughts to other places and things. Orthodox Christians have always practiced this throughout the centuries and it is called prayer and especially the Jesus Prayer. The first step in prayer is to first quiet down. Collect our thoughts, recognize we are in the presence of God. And only then to begin praying either at home or as we participate in a liturgical service in church. If our mind wanders away we slowly bring it back to the words of the prayers or hymns and resist the urge to look around at our surroundings. The Jesus Prayer which we practice at home follows the same pattern: finding quiet, collecting our thoughts and only then to begin the prayer: Lord Jesus Christ, Son of God, have mercy on me. When our mind begins to wander off to other places and things we slowly bring it back to our prayer. May the life of our new saint: St. Savvas the New inspire us, to see God in silence and quiet. Have a daily quiet time in which we take out our Bible and prayerbook.